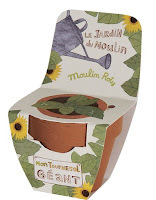 Moulin Roty have just introduced a lovely new range of little gardening things. 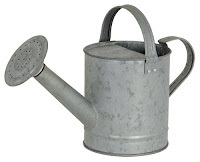 Le Jardin du Moulin is a selection equipment and accessories including tools, buckets and watering cans, packets of seeds, gardening clothing and even a journal. There is also a lovely range of wooden items - wheel barrow, weather vane and a beautiful cart to store your gardening things. Obviously it's all designed for little ones, but to my mind a lot of these items would look lovely in a grown up's potting shed. I love things in miniature and that's exactly what this range is - a classic French gardening range in petit proportions. We're hoping for delivery next month sometime and I will create a special section on my website for summer / gardening things I think. In the meantime I am adding a selection of photos... let me know what you think. Oh, I nearly forgot prices... ball park figures: buckets from £3, seeds about £5, tools are £10-£15 (and the gardening cart is £200+ but we won't dwell on that one!! ).